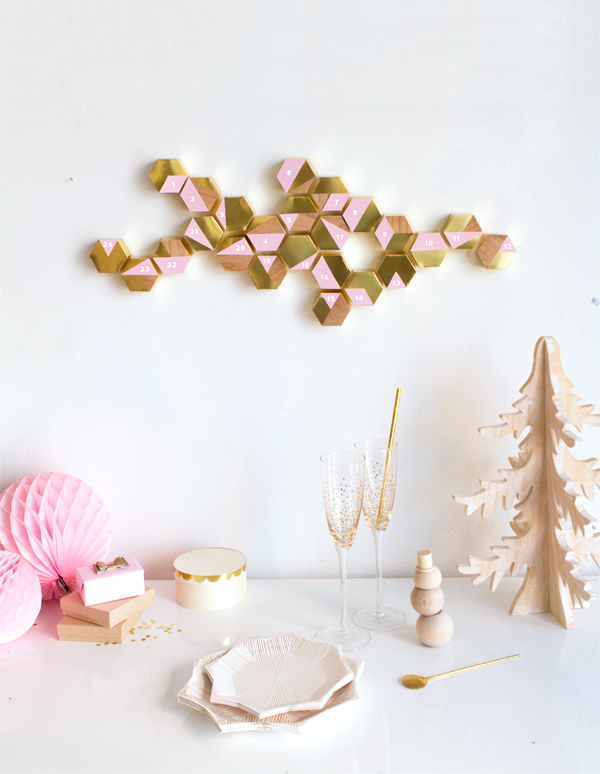 This project show you how to create a geometric work of art that doubles as a modern Christmas advent calendar! 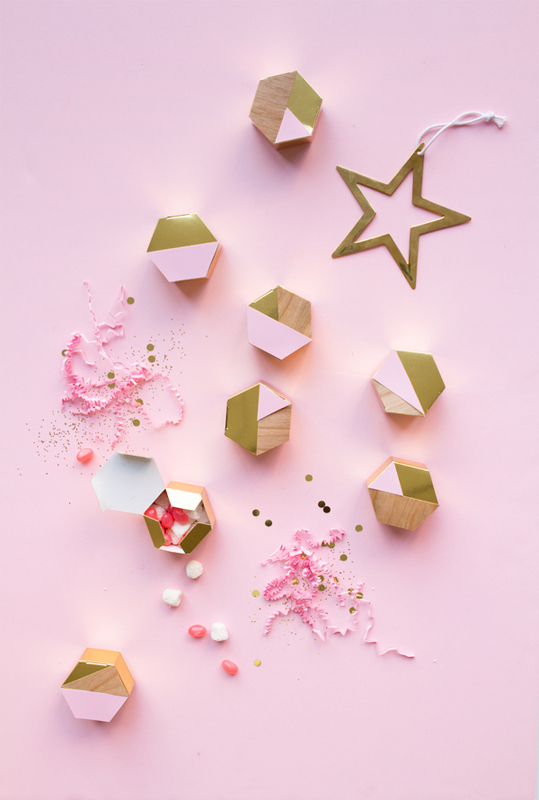 It’s really simple to transform these cute and affordable gold hexagon favor boxes by adding touches of pink and wood grain then filling with treats and hanging in a decorative formation along your wall! 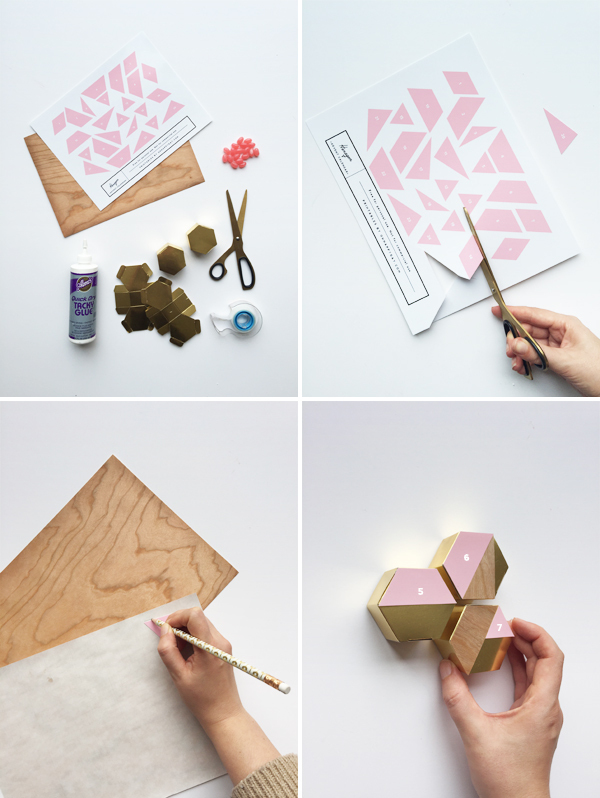 Tools and Materials: Pink shapes printable, Color Printer, Glossy photo paper, 2 packs of mini gold hexagon boxes (a dozen in each), Scissors, Pencil, Wood sticker paper, Glue, Candy, Double-sided removable mounting tape. Step 1: Download then print out the design. 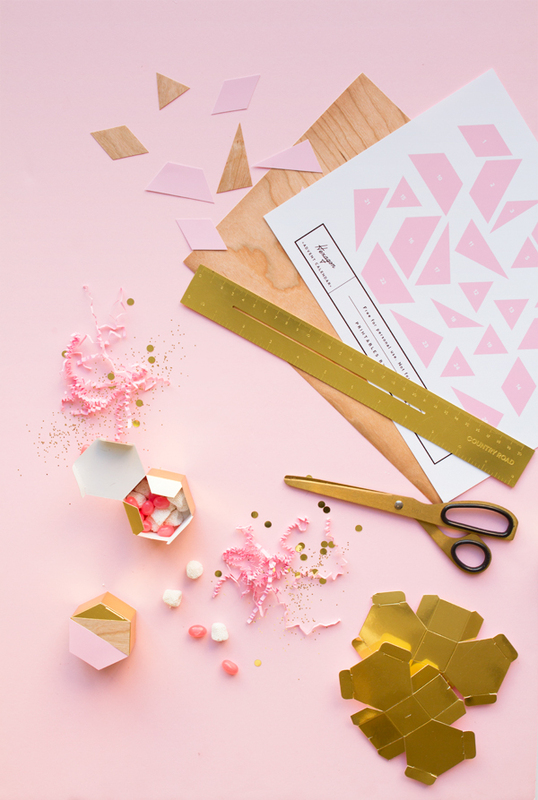 Cut out the numbered pink shapes with scissors. Step 2: Use these to then trace around the back of the wood sticker paper and create the wood shapes that are needed to complete the design. Step 3: Use glue to stick the pink shapes onto the hexagons. Peel the back off the wood paper to stick these in place. Use our images a as guide for placement. Step 4: Fill each hexagon box with candy and/or small trinkets and toys. Step 5: Use double-sided removable mounting tape to attach hexagons to wall. Use images above as guide for the formation. it’s brilliant ! I’m found of geometric shapes at the moment and hexagon shape is by far my favorite ( I’m French ). I love your calendar, it’s simplicity, colors scheme and the way you arranged it, like a sculpture. 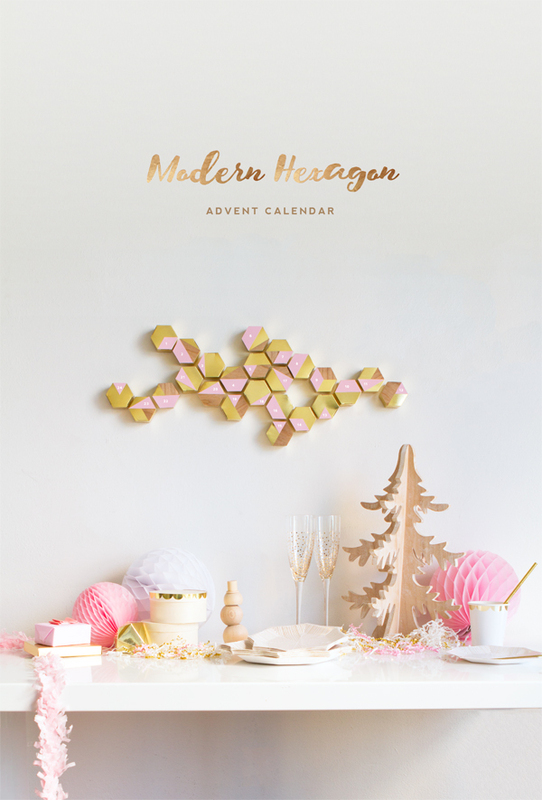 I absolutely love advent calendars and yours is brilliantly modern! Nice job! I think I would put little notes in each one. This is such a fun and cute idea! We definitely need to make an advent calendar this year! We’ve never done one with our son and this is his 4th Christmas! Wow, an advent calendar and a wall installation in one piece! I love that! This is such a lovely idea! Just one question, any idea where to source wood grain paper in the UK? I can’t find it on amazon…. beautiful.. this is gives me idea to make my own calendar. By the way,.. those pictures are so clean and looks greats, are you a photographer too? This is awesome, but it looks so nice that I’d be pretty reluctant to let the kids actually use it! What a really great and awesome idea! I would honestly love to have these up for the whole year. Haha! What a beautiful way to bring in christmas!! This is such cute idea! I love it! What an awesome idea! So stylish + modern – love it!! I am in love! What an awesome idea! The coolest advent calendar I’ve ever seen! Beautiful DIY and very beautiful pictures!!!!! I love it! I definitely want to try this DIY. The result is just awesome! Thanks for sharing all these brilliant ideas. Love this project! Can you share your source for the champagne flutes in the photos?